Oddly enough Downsizing and decluttering have become trendy. It sounds like the opposite of a trend. More like a practical thing you procrastinate about. An idea that brings on guilt every time you open your closet. Yet, somehow decluttering has become a full-fledged movement. From getting rid of clothes you don’t wear to a full house purge, the after-effects are things we all want in our lives. Less anxiety, less stress and improved habits. I’m going to show you how downsizing and decluttering can be an opportune time to refresh your mindset and your home. It’s not only a time to hone in on what brings you the most joy, pass along joy to others, and lighten your load. It’s also a time to pause and consider the possibilities in what you already own. You can refresh the design and style of your home in a way that celebrates the story of your life and who you are now. Before I get to the creative re-purposing part of downsizing, we’ll need a place to start. When you’ve accumulated a significant amount of clutter deciding where to start can become an “I’ll deal with it later” situation pretty quickly. When I’m walking through someone’s home, loving their marvelous things, I internally cringe at the idea of getting rid them. Especially, when a great story is attached. I feel some of their loss and understand how the memories and emotions attached to these things can make it feel impossible to decide what should go. Clutter comes in many forms and includes the sentimental things and the accumulated things like art supplies and sports equipment from forgotten hobbies. This time emotions can flare but now its regret about the money spent or the good intentions we let slip. This starts us on a cycle of should have, could have, that leads to inviting these things back into our life because this time it will be different. Inevitably, different never happens, and the dust keeps accumulating. If you’re looking for help dealing with the organization process and emotional aspects of downsizing and decluttering there are numerous professional organizers and decluttering experts in the Philadelphia, Main Line and Western Suburbs who can help. I belong to a professional organization called NetCare. I met Annie Richard of Amoon’s Custom Organizing. She is an organizing professional who prides herself on approaching each project with a devotion to creating the best possible solutions for her clients. There are also books to read if want to do it yourself. Full disclosure, I haven’t read these books. I only know of them because of the decluttering trend. The Life-Changing Magic of Tidying Up by Marie Kondo. This is the one that sparked the whole decluttering movement. It’s about the process of organizing and only keeping things that spark joy for you. If you really just want to be mindlessly entertained by others decluttering problems there are plenty of TV shows. Starting in the early 2000’s with shows like HGTV’s Organization and TLC’s Clean Sweep. My personal favorite Hoarders on A&E premiered in 2009. When something akin to mundane old spring cleaning hits the big time to become a TV series you know, it’s a nationwide trend. Downsizing and decluttering isn't just trendy, it's a real necessity for most baby boomers. There are a lot of reasons to declutter, from a safety standpoint, the number one reason is clearing out tripping hazards. Piles and things that narrow or obstructed paths of travel are a safety issue that keep you from moving confidently and safely through your home. Other decluttering necessities occur when you're preparing to age in place or downsize to a smaller home or living facility. It could also be that you don’t want to feel like a burden to your adult children, and you’re feeling pressure to deal with your things. Now that you’re thinking about how and why you’re going to declutter let’s take a step back and think. Before you throw things out, make donations or start sharing the joy of your stuff with family and friends let’s think what you can do with your very favorite things. What are the options if you can’t seem to let go of some things? 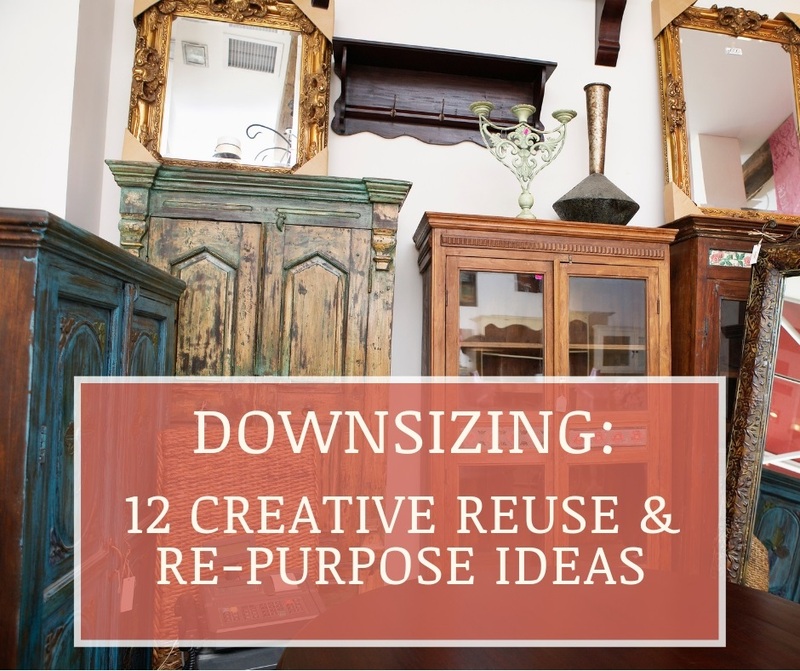 I’m going to share with you creative reuse ideas for repurposing your favorite things you come across while downsizing and decluttering. We're going to celebrate your rich story and fond memories. Reuse allows you to have a clutter-free home and you get to keep more of what you own by giving your things a makeover in use and style. 1. Taking pictures once require having them developed and we still have tons of pictures without proper homes. Stuffed in boxes, they go unappreciated. Gather your very favorites and frame them together in a collage or separately. Create a gallery wall or beautiful display on a mantel. 2. If you still have game boards around and fond memories of playing them with your family, frame your favorite. They make for a great graphic display and focal point in a room. 3. Create an objet d’ art by choosing one favorite item like a teacup and display it on a white tablecloth all by itself to be appreciated for the beauty it is. 4. Collect your candle holders and group them together for dramatic effect. Get flameless candles and turn them all on to warm the evenings. Consider changing the color of the candles with the seasons. 5. Use old ladders as easy access storage for blankets. Or make the ladders into shelves. 6. Use tins to organize your desk or food in your pantry. 7. Linens you don’t use anymore like table clothes can be repurposed as a light coverlet or made into a throw pillow. 8. Give new life to your favorite chair by having it reupholstered in a fabulous new fabric. 9. Have a seamstress piece handkerchiefs together to make a curtain. 10. Decoupage is a great way to reuse newspapers, magazines, maps, pictures or posters by turning them into wallpaper or a new top for a table. 11. Group your collections together to maximize the impact. Do you have a lot of cat statues? Put them all in your powder room and make it unexpectedly whimsical. 12. Take a piece of furniture like a dresser and remove the drawers. Now you have shelves. Give it a fresh coat of paint and you’ve created a pretty and practical piece. Getting started with decluttering can take some preparation and bring up a lot of emotions. You might want to read about it first or hire someone to help. No matter how you approach it, the rewards are worth your effort, appreciated by your family and a weight lifted off of your shoulders. When you narrow your things down to what you really love and give them a new life, they become new all over again. You’ll feel renewed pride and pleasure in the things you’ve chosen for this new chapter of your life. Plus you can feel good about making the green choice by not adding to our landfills. Decluttering is a welcome trend I’d like to stick around. We could all benefit from less stuff and more happiness. If your stuck coming up with ways to repurpose what you have I’m the interior designer you’re looking for. My background in art and craft adds a special layer of creative know how to my design skills. I love taking what you already own and incorporating them into beautiful designs for your home. If you’d like to tell me about your decluttering or repurposing project you can book a design discovery call with me.